Twenty five percent of women have severe menopausal symptoms, which can seriously affect a woman’s quality of life. Millions of women worldwide now live 30-40% of their lives after the menopause. HRT is the most effective treatment for the relief of vasomotor symptoms although other options, including non-pharmacological ones, are available. NICE recommendations are based on systematic reviews of the best available evidence and explicit consideration of cost effectiveness. When minimal evidence is available, recommendations are based on the Guideline Development Group’s experience and opinion of what constitutes good practice. Evidence levels for the recommendations are given in italic in square brackets. -They do not have a uterus and do have menopausal symptoms (such as vasomotor, musculoskeletal, and urogenital symptoms; effects on mood; or sexual difficulties). -Only if they are not taking combined oestrogen and progestogen contraception or high dose progestogens. -Long term health implications of menopause, such as osteoporosis. -Oestrogen alone to women without a uterus. -The safety of different preparations is uncertain and interactions with other drugs have been reported. *The impact of HRT that is started after 65 years was outside the scope of the guideline (see tables 1-4 of full guideline6). For advice on the treatment of menopausal symptoms in women with breast cancer or at high risk of breast cancer, see section 1.13 of the NICE guideline on early and locally advanced breast cancer9 and section 1.7 of the NICE guideline on familial breast cancer10. -Referral to a healthcare professional with expertise in menopause. -Transdermal HRT at standard therapeutic doses does not increase the risk. -HRT is an option for women with cardiovascular risk factors as long as these are optimally managed. 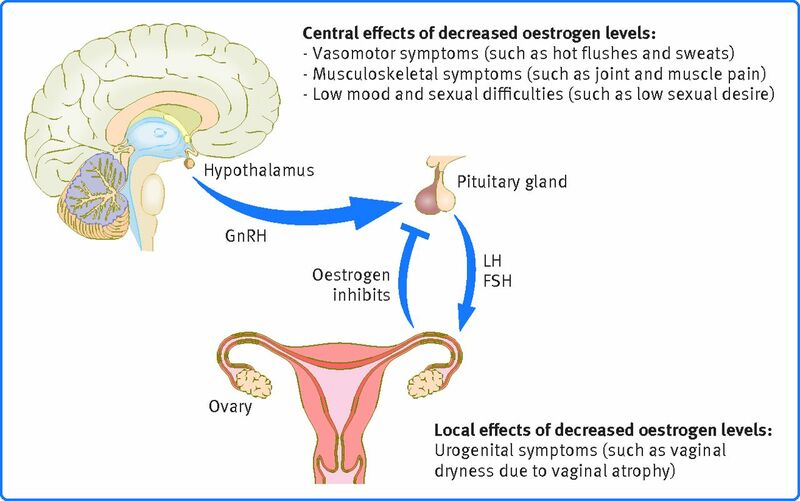 Taking oral (but not transdermal) oestrogen is associated with a small increase in stroke. -Any increase in risk of breast cancer occurs during treatment and returns to baseline after stopping HRT. -The beefit may continue for longer (after treatment stops) in women who have taken HRT for longer (more than 10 years). -Raised FSH levels on two blood samples taken four to six weeks apart. Committee members involved in this guideline included three lay members who contributed to the formulation of the recommendations summarised here. This guideline aims to standardise the care of women in menopause and fill in the knowledge gap regarding the risks and benefits of treatments for menopausal symptoms. Around a million women in the UK use treatment for their menopausal symptoms.11 The advice on different treatments and support available is variable and is based on studies that have now been reanalysed and the conclusions amended. This guidance was developed by the National Collaborating Centre for Women’s and Children’s Health in accordance with National Institute for Health and Care Excellence (NICE) guideline development methods (www.nice.org.uk/media/default/about/what-we-do/our-programmes/developing-nice-guidelines-the-manual.pdf). A Guideline Development Group was established by the National Collaborating Centre for Women’s and Children’s Health, which incorporated healthcare professionals (including gynaecologists, nurses, physicians, and two GPs) and lay members. The GDG identified relevant clinical questions, collected and appraised clinical evidence, and evaluated the cost effectiveness of proposed interventions where possible. A network meta-analysis was undertaken to identify the clinical effectiveness of different types of treatments (pharmacological and non-pharmacological) for the treatment of menopausal symptoms and used to inform a cost effectiveness analysis. The draft guideline underwent a public consultation in which stakeholder organisations were invited to comment; the GDG took all comments into consideration when producing the final version of the guideline. Four different versions of this guideline have been produced: a full version containing all the evidence, the process undertaken to develop the recommendations, and all the recommendations; a care pathway (http://pathways.nice.org.uk/pathways/menopause); a version containing a list of all the recommendations, known as the “short guideline;” and a version for patients (www.nice.org.uk/guidance/ng23/informationforpublic). All of these versions are available from the NICE website (www.nice.org.uk/guidance/ng23). Updates of the guideline will be produced as part of NICE’s guideline development programme. Audit hormone replacement therapy (HRT) prescriptions for women with body mass index over 30. Review those taking oral HRT preparations and offer transdermal HRT instead because the risk of venous thromboembolism (VTE) is associated with obesity and increased by oral HRT but not transdermal HRT. Audit requests for serum follicle stimulating hormone (FSH) tests—what proportion were in women over 45 years old? Do you need to change your practice by instead diagnosing menopause in this age group on the basis of clinical features alone (no periods for at least 12 months in women not using hormonal contraception or menopausal symptoms in women without a uterus)? In women who have been treated for breast cancer, what is the safety and effectiveness of alternatives to systemic HRT as treatments for menopausal symptoms? In women with a previous diagnosis of breast cancer, what is the impact of systemic HRT usage on the risk of breast cancer recurrence, mortality, or tumour aggression? What is the difference in the risk of breast cancer in menopausal women on HRT with progesterone, progestogen, or selective oestrogen receptor modulators? How does the HRT preparation affect the risk of VTE? What is the impact of estradiol combined with the levonorgestrel releasing intrauterine system on the risk of breast cancer and VTE? What are the effects of early HRT use on the risk of dementia? What are the main clinical manifestations of premature ovarian insufficiency and the short term and long term impact of the most common therapeutic interventions? This is one of a series of BMJ summaries of new guidelines based on the best available evidence; they highlight important recommendations for clinical practice, especially where uncertainty or controversy exists. The members of the Guideline Development Group were: Terry Aspray, Claire Bowring, Melanie Davies (until November 2014), Deborah Holloway, Sally Hope, Deborah Keatley, Mary Ann Lumsden, Sara Moger, Prunella Neale, Nicholas Panay, Anthony Parsons, Imogen Shaw, and Christine West (from January 2015). The members of the National Collaborating Centre for Women’s and Children’s Health technical team were: Grammati Sarri, Melanie Davies (from December 2014), Annabel Flint, Yelan Guo, Sadia Janjua, Hugo Pedder, Paul Jacklin, and Zosia Beckles. Contributors: All authors contributed to the initial draft, helped revise the manuscript, and approved the final version for publication. GS is guarantor. Funding: The National Collaborating Centre for Women’s and Children’s Health was commissioned and funded by the National Institute for Health and Care Excellence to develop this guideline and write this BMJ summary. Competing interests: We declare the following interests based on NICE’s policy on conflicts of interests (available at: www.nice.org.uk/Media/Default/About/Who-we-are/Policies-and-procedures/code-of-practice-for-declaring-and-managing-conflicts-of-interest.pdf). MAL has been remunerated for chairing NICE guideline development committees and is vice chair of the the Women’s Health Expert Advisory Group to the Medicines and Healthcare products Regulatory Agency (MHRA). MD receives no direct funding for her advisory or educational roles. The authors’ full statements can be viewed at www.bmj.com/content/bmj/351/bmj.h5746/related#datasupp. Avis NE, Crawford SL, Greendale G, et al; Study of Women’s Health Across the Nation. Duration of menopausal vasomotor symptoms over the menopause transition. JAMA Intern Med2015;175:531-9. Blümel JE, Chedraui P, Baron G, et al. A large multinational study of vasomotor symptom prevalence, duration, and impact on quality of life in middle-aged women. Menopause2011;18:778-85. Lumsden M. The hormone replacement therapy controversy. BJOG 2005;112:689-91. Kreiger N, Löwy I, Aronowitz R, et al. Hormone replacement therapy, cancer, controversies, and women’s health: historical, epidemiological, biological, clinical, and advocacy perspectives. J Epidemiol Community Health2005;59:740-8. National Institute for Health and Care Excellence. Menopause: diagnosis and management of menopause. (NICE guideline 23.) 2015. www.nice.org.uk/guidance/ng23. National Institute for Health and Care Excellence. Depression in adults: recognition and management. (Clinical guideline 90.) 2009. www.nice.org.uk/guidance/cg90. National Institute for Health and Care Excellence. Suspected cancer: recognition and referral. (NICE guideline 12.) 2015. www.nice.org.uk/guidance/ng12. National Institute for Health and Care Excellence. Early and locally advanced breast cancer: diagnosis and treatment. (Clinical guideline 80.) 2009. www.nice.org.uk/guidance/cg80. National Institute for Health and Care Excellence. Familial breast cancer: classification, care and managing breast cancer and related risks in people with a family history of breast cancer. (Clinical guideline 164.) 2013. www.nice.org.uk/guidance/cg164. Health and Social Care Information Centre. Prescription cost analysis—England, 2010. 2011. www.hscic.gov.uk/catalogue/PUB02274. Chiechi LM, Berardesca C, Lobascio A, et al. Postmenopausal users of long-term hormonal replacement therapy: social-cultural features. Clin Exp Obstet Gynecol1999;26:88-90.